Address: A506,New Base 360 Internet Industrial Park, NO.163,Dongcheng District,Dongguan City,China. 2. )Fashionable patterns and customized design available. 3. )eco friendly sticky strong glue. 4. )Plenty of different shapes for various decoration. 1. Remove dirty surface of object before use it. 2. Confirm the size what you need, peel with a plier and stick directly on object. 3. Pree it for several minutes till fix enough. Warming: Keep it away from children who under 3 years to avoid them eating it . Available with charges if it's customized design. B) Easy to apply and remove. C) Last for days . Q 1. How many is 1 gross? A: The Gross is the unit of rhinestone.1 Gross=144pcs. Q 2. How to identify the rhinestone quality? Q 3. How do I purchase your goods? Q 4. How long is the lead time? 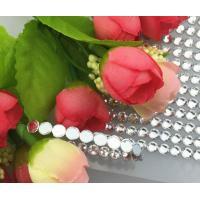 Our company has been in rhinestone industry for 12 years. There are 3 manufactured factories and more than 100 cooperated factories nowadays. In this way, the production and supply capacity is strong and steady. We are good at all kinds of bling crystal manufacture and development. It's our pleasure to help customers with new product development and innovation. The delicate crystals could make your products more shine and increase additional value. We attach highly attention on research and develop new products to follow up with the fashion market trend. It would be our grateful to bulid up long term business relationship with you. Let us be your reliable supplier.